Vital Remains (1988-present) is a Death Metal band from Providence, Rhode Island, USA. he definition of extreme can be interpreted in many ways, Vital Remains, however, takes its meaning to a whole new level, be it through using their instruments as weapons for mass annihilation or through unrelenting, blasphemous lyrics that display their hatred of religion and all that it stands for. Add death metal legend Glen Benton (of Deicide) later in their career to the mix, and you have one of very few extreme metal bands are able to reinvent their musical styles, yet Vital Remains are one of the few to stand the test of time. The group formed in 1989 in Providence, Rhode Island, and after recording two demos, they signed to 'Peaceville's' subsidiary 'Deaf Records'. They soon recorded the now cult albums Let Us Pray (1992) with the membership of Jeff Gruslin (vocals), Paul Flynn (guitars), Joe Lewis(bass), and Tony Lazaro (guitars/bass) and Into Cold Darkness (1995) featuring Rick Corbett on drums, but due to poor distribution and promotion from the label, the band asked to be let go from the contract. Two years later they signed a two album deal with French label 'Osmose Records' and unleashed Forever Underground (1997) and Dawn of The Apocalypse (1999) featuring Thorn on vocals. They revamped their line-up in 2001 with original member Tony Lazaro on guitars, Dave Suzuki on bass, drums and lead guitars, and Glen Benton (ex-Deicide) on vocals. They also signed a new deal with 'Olympic Recordings' to unleash Dechristianize (2003). This 9-track epic, recorded at Morrissound Studios (Morbid Angel/Six Feet Under) combined melody with an evil atmosphere and a traditional 'metal' feel, with no shortage of satanic verses. They would follow that up with Icons Of Evil (2007). 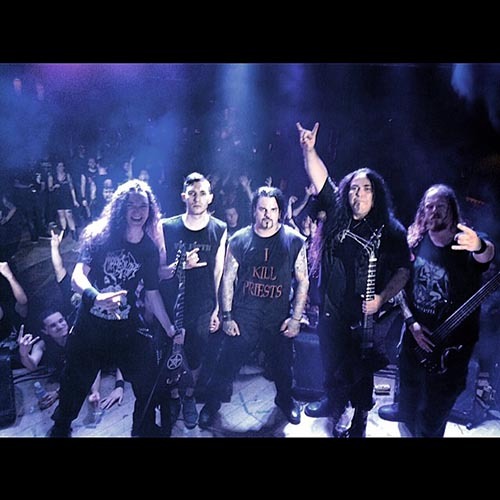 Since 2007, the band continued touring, but experienced frequent lineup changes; most notably, in late 2014 and early 2015, the band added drummer James Payne (ex-Hour of Penance), and Toronto-based Dean Arnold (of Primal Frost) as lead guitarist.